Title card from episode "Akim the Terrible"
Flash Gordon is a science fiction television series based on the King Features characters of the Alex Raymond-created comic strip of the same name. Diverging from the storyline of the comics, the series set Flash, Dale Arden and Dr. Zarkov in the year 3203. As agents of the Galactic Bureau of Investigation, the team travels the galaxy in their ship the Sky Flash, battling cosmic villains under the order of Commander Paul Richards. The series proved popular with American audiences and critical response, though sparse, was positive. Flash Gordon has garnered little modern critical attention. What little there is generally dismisses the series, although there has been some critical thought devoted to its presentation of Cold War and capitalist themes. Universal Studios had held the production rights to Flash Gordon but allowed them to lapse. Former Universal executives Edward Gruskin and Matty Fox struck a deal with Flash Gordon owners King Features Syndicate to produce the first 26 episodes of the series. The series was produced by Gruskin and Wenzel Lüdecke. Writers for Flash Gordon included Gruskin, Bruce Geller and Earl Markham. Episodes were directed by Wallace Worsley, Jr. and Gunther von Fritsch. Composers Kurt Heuser and Roger Roger provided much of the original music. "No matter what galaxy we explored, everyone spoke with a German accent. The use of German actors who could not speak English required us to use a lot of close-ups. I would stand behind the camera, correctly positioned for the actor's look, and read his or her line; the actor would then repeat the line, mimicking my pronunciation and emphasis." The series was budgeted at USD $15,000 per episode on a three-day-per-episode shooting schedule. Citing salary disputes, Worsley withdrew from the project after completing the first 26 episodes. Production was moved to Marseille under the direction of Gunther von Fritsch for the 13 final episodes. At that time, producer Luedecke was replaced by American producer Edward Gruskin. The series was filmed in West Berlin and Marseille as a West German, French and American co-production by Intercontinental Television Films and Telediffusion. The series aired in syndication throughout most of the U.S. but also aired on the east coast on the DuMont Television Network. Flash, Dale and Zarkov travel to the planet Tarset to investigate an ancient curse. They must overcome a traitorous scientist and thwart an invasion from the evil planet Ebon. Flash and Zarkov must rescue Dale from a mad criminal who seeks to kidnap her with his time machine. Flash and company square off against the Electro Man, a mysterious deity who reigns over a planet where all life is made of metal. The mad Rabeed returns after 100 years in exile with plans to destroy the galaxy. It is up to Flash, Dale and Zarkov to stop his evil scheme. The evil King Akim rules Charon, where the only law is lawlessness. After Akim brainwashes Flash's best friend into attempting to assassinate Flash, Flash and Dale travel to Charon to thwart Akim's nefarious schemes. An old prospector who hits his claim and his daughter are threatened by claim jumpers and it is up to Flash and friends to protect them. The GBI team is help captive in a vibrational device that leads people to commit suicide. Flash's greatest enemy escapes from prison and seizes control of the Sky Flash. Zarkov's experiments to return life to dead worlds are endangered. Flash, Dale and Zarkov battle against an invading army of ancient androids. Flash and his GBI colleagues protect the king of the planet Xerxes, who is being plagued by terrible phantoms. A robot loaded with atomic bombs is launched into space. Flash must retrieve it before it's too late. A planet whose culture resembles the Middle Ages is ruled by a despotic magician. Can Flash, Dale and Zarkov end his evil reign? The Sky Flash falls under attack by a powerful sonic weapon. The GBI crew faces a woman who can turn humans to stone with a single look. Flash and company travel to Masca, a silent planet. Prudentia, evil queen of the planet Diana, kidnaps Dale Arden to force her to reveal the secret of faster-than-light travel. Flash and Zarkov must use that secret themselves to travel back in time to save Dale's life. The galaxy is threatened by torrential rains and flooding. Zarkov suspects the rains are a plot and the crew sets out to foil it. Half of the planets are lined up to strip the GBI of its authority and distribute its secrets amongst them. Earth casts the deciding vote in favor of keeping the GBI in control and selects Commander Richards to deliver the vote to the Galaxy Council on Mars. Krybian, the evil representative of Pluto, conspires with a master criminal to prevent Richards from voting, thus ensuring that GBI will lose its power. Flash foils the conspiracy and delivers Richards on time. Part 1 of 3. Zydereen, the "Witch of Neptune," plots to take over the planet. To that end she brainwashes Zarkov and Commander Richards to destroy the planet's atmospheric converters. Part 2 of 3. Flash and Dale race to Saturn to clear the names of the captive Zarkov and Commander Richards, accused of sabotaging Neptune's atmospheric converters. They battle the evil Zydereen, "Witch of Neptune," who brainwashed the captives and has stolen their knowledge of galactic defense. Part 3 of 3. Using her stolen knowledge, Zydereen, Witch of Neptune, builds a solar ray and threatens to destroy all life if she is not declared Queen of the Galaxy. Flash and Dale race to Neptune to thwart her evil plot. Underwater creatures wish to live out of the water, so they plot to steal a device to allow them to live on land. As the Sky Flash is pulled off-course to an uncharted planet, every machine on Earth is seized by a mysterious "mechanical paralysis." Flash, Dale and Zarkov must stop Ziering, ruler of Planet X, before he can kidnap the 100 leading scientists from Earth in his bid to take over the galaxy. From the near-lifeless planetoid Theta N-1, Dr. Fabian Prendis puts out a desperate call to Dr. Zarkov, at the command of his mysterious master. Upon arrival, Zarkov is taken captive and learns that Prendis is dead. His captor is a "lion-man" who demands that Zarkov continue Prendis' "transmutation" experiment to make him fully human in appearance. Flash and Dale discover where Zarkov has gone and race to his rescue. Increases in the Earth's temperature are traced to the planet Caloria. Flash and his crew must thwart the invasion. Flash, Dale and Zarkov must stave off a galactic invasion by a plague of devouring insects. A man called Evil confronts Flash, turning all of Flash's friends against him. The GBI investigates a case of jewels mysteriously disappearing and reappearing. Flash and company work to stop a villain who is able to shrink people and entire planets. Flash and the GBI must stop smugglers who are transporting a drug that causes a hypnotic trance. The rulers of a disease-ridden planet prevent Flash, Dale and Zarkov from trying to stop the epidemic. The planet Saturn seeks to join the Galaxy Council but the son of the king acts to oppose it. Queen Cygnil has the power to kill with a machine that turns people into photographic negatives, and it's up to Flash and friends to stop her. A series of unexplained earthquakes prompt Flash to travel to the center of the planet to discover the cause. There he, Dale and Zarkov encounter Zaldu, despotic ruler of the underground kingdom, and must halt his plans to burn his way through to the surface world to invade. Planets are being destroyed and Earth is next. Flash, Dale and Zarkov must time-travel to 1950s Berlin to defuse a bomb planted 1,250 years in the past. Dale goes missing and a desperate Flash must find her. Flash, Dale and Zarkov investigate the mysterious disappearances of a number of spaceships. Strange tremors again threaten Earth, and Zarkov discovers that the evil Zaldu has survived his previous encounter with Flash and company and rebuilt his kingdom. The GBI team must once more journey deep underground in the Earth-borer Earthworm to thwart Zaldu once and for all. Variety noted that the series was from a technical standpoint "up to the demands of the script and the average viewer probably won't notice the differences in quality between this and home-grown produce". Flash Gordon was immediately popular in the United States and continued to run in syndication into the early 1960s. Modern critical reaction to the series has been light but largely negative. The production values are frequently derided, with the series described as "bargain-basement". The televised series suffered in comparison to the earlier film serials with the television incarnation labeled "vastly inferior," lacking "good concepts and scripts" and "most of all, [lacking] Buster Crabbe, who was Flash Gordon". One positive comment notes Champlin's portrayal of Dale Arden, who was transformed from the typical damsel in distress of the serials into a trained scientist and a "quick thinker who often saved [Flash and Zarkov] from perishing". 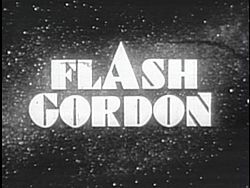 Film theorist Wheeler Winston Dixon, far from decrying the series for its production values, finds that "the copious [use of] stock footage and the numerous exterior sequences shot in the ruins of the bombed-out metropolis give Flash Gordon a distinctly ravaged look". He writes that its international origins give the series "an interesting new cultural dimension, even a perceptible air of a split cultural identity". Dixon quotes German cultural historian Mark Baker, who writes of a particular scene from the episode The Brain Machine as emblematic of this cultural split. The scene uses stock footage of a June 17, 1953 demonstration by East Berlin workers against the East German government. Soviet tanks opened fire on both demonstrators and bystanders, thus confirming East Germany's status as a Soviet puppet state in the minds of West Germans. American viewers, Baker speculates, were probably unaware of the iconic power in West Germany of the images of fleeing East Berlinners, which were used to illustrate a panic on Neptune. Dixon, noting the similarities between the ideals espoused by "space operas" like Flash Gordon, Captain Video and Rocky Jones, Space Ranger and American Cold War values, argues that such series were designed to instill those values into their young viewers. Flash Gordon, he writes, along with its fellow space operas, "have a common, unifying theme: peace in the universe can be achieved only by dangerous efforts and the unilateral dominance of the Western powers." This echoes the earlier critique of Soviet writer G. Avarin, who in the Soviet film journal Art of the Cinema had accused Gordon and other space-faring characters of being "the vanguard of a new and greater 'American imperialism'". The "ravaged look" of the series, Dixon writes, "underscores the real-world stage on which the action of the space operas played". Physical copies of two episodes, "Escape into Time" (October 8, 1954) and "The Witch of Neptune" (March 4, 1955), are held in the J. Fred MacDonald collection at the Library of Congress. A total of fourteen episodes are currently available in the public domain, both on various DVD releases and on websites such as the Internet Archive: Episodes 1, 5, 6, 8, 10, 17, 19, 20, 21, 22, 24, 25, 36, and 39. ^ There are sources that incorrectly indicate that the series was broadcast as early as January 1954, c.f. Vernon, Terry (January 11, 1954). Tele-Vues. Long Beach (California) Independent, p. 16. "'FLASH GORDON', based on the famous comic strip, comes to TV as a film series on KTLA (5) Jan. 24. STEVE HOLLAND portrays "Flash. "; Albuquerque Journal advertisement, p. 24 (March 1, 1954). "FOLLOW FLASH GORDON as he rockets to adventure in the first exciting episode of SPACE SOLDIERS". However, the original Universal Studios Flash Gordon serials were re-titled Space Soldiers for television syndication, c.f. Shales, Tom (August 10, 2007). p. C01. "'Flash Gordon' Is More Comic Than Cosmic on Sci Fi." Washington Post. ^ Wertz, Diane (August 9, 2007). "'Flash Gordon' not out of this world". Newsday. Archived from the original on November 14, 2007. Retrieved December 3, 2007. ^ "Flash Gordon and the Planet of Death". Flash Gordon. Season 1. Episode 1. October 1, 1954. ^ "Flash Gordon (1954)". Epguides.com. George Fergus. Retrieved March 26, 2017. ^ "Episode Detail: Escape Into Time - Flash Gordon". TV Guide. Retrieved October 11, 2008. ^ "Episode Detail: The Electro Man - Flash Gordon". TV Guide. Retrieved October 11, 2008. ^ "Episode Detail: The Vengeance of Rabeed - Flash Gordon". TV Guide. Retrieved October 11, 2008. ^ "Episode Detail: The Claim Jumpers - Flash Gordon". TV Guide. Retrieved October 11, 2008. ^ "Episode Detail: The Dancing Death - Flash Gordon". TV Guide. Retrieved October 11, 2008. ^ "Episode Detail: The Breath of Death - Flash Gordon". TV Guide. Retrieved October 11, 2008. ^ "Episode Detail: The Great Secret - Flash Gordon". TV Guide. Retrieved October 11, 2008. ^ "Episode Detail: Return of the Androids - Flash Gordon". TV Guide. Retrieved October 11, 2008. ^ "Episode Detail: The Frightened King - Flash Gordon". TV Guide. Retrieved October 11, 2008. ^ "Episode Detail: The Deadly Deception - Flash Gordon". TV Guide. Retrieved October 11, 2008. ^ "Episode Detail: Duel Against Darkness - Flash Gordon". TV Guide. Retrieved October 11, 2008. ^ "Episode Detail: The Sound Gun - Flash Gordon". TV Guide. Retrieved October 11, 2008. ^ "Episode Detail: The Weapon That Walked - Flash Gordon". TV Guide. Retrieved October 11, 2008. ^ "Episode Detail: Mission to Masca - Flash Gordon". TV Guide. Retrieved October 11, 2008. ^ "Episode Detail: The Rains of Death - Flash Gordon". TV Guide. Retrieved October 11, 2008. ^ "Episode Detail: The Witch of Neptune - Flash Gordon". TV Guide. Retrieved October 11, 2008. ^ "Episode Detail: The Water World Menace - Flash Gordon". TV Guide. Retrieved October 11, 2008. ^ "Episode Detail: Heat Wave - Flash Gordon". TV Guide. Retrieved October 11, 2008. ^ "Episode Detail: The Hunger Invasion - Flash Gordon". TV Guide. Retrieved October 11, 2008. ^ "Episode Detail: Encounter With Evil - Flash Gordon". TV Guide. Retrieved October 11, 2008. ^ "Episode Detail: The Matter Duplicator - Flash Gordon". TV Guide. Retrieved October 11, 2008. ^ "Episode Detail: The Micro-Man Menace - Flash Gordon". TV Guide. Retrieved October 11, 2008. ^ "Episode Detail: The Space Smugglers - Flash Gordon". TV Guide. Retrieved October 11, 2008. ^ "Episode Detail: The Mystery of Phoros - Flash Gordon". TV Guide. Retrieved October 11, 2008. ^ "Episode Detail: The Shadowy Death - Flash Gordon". TV Guide. Retrieved October 11, 2008. ^ "Episode Detail: Death in the Negative - Flash Gordon". TV Guide. Retrieved October 11, 2008. ^ "Episode Detail: Flash Gordon - Flash Gordon". TV Guide. Retrieved October 11, 2008. ^ "The Subworld Revenge". Flash Gordon. Season 1. Episode 39. July 15, 1955. ^ "Episode Detail: The Law of Velorum - Flash Gordon". TV Guide. Retrieved October 11, 2008. ^ "Episode Detail: The Skyjackers - Flash Gordon". TV Guide. Retrieved October 11, 2008. ^ Kasischke, Richard (February 5, 1954). "Soviet Critic Blasts U. S. Spacemen As 'Imperialists'". Stevens Point Daily Journal. Stevens Point, Wisconsin. Associated Press. p. 5. ^ "Classic Sci-Fi TV - 150 Episodes". Mill Creek Entertainment. Retrieved March 2, 2016. ^ "Classic TV : Free Movies : Download & Streaming". Internet Archive. Retrieved March 2, 2016. Bassoir, Jean-Noel (2004). Space Patrol: Missions of Daring in the Name of Early Television. McFarland & Company. ISBN 0-7864-1911-3. Cook, John R. and Peter Wright (2006). British Science Fiction Television: A Hitchhiker's Guide. I.B. Tauris. ISBN 1-84511-047-1. Harmon, Jim and Donald Frank Glut (1973). The Great Movie Serials: Their Sound and Fury. Routledge. ISBN 0-7130-0097-X. Dixon, Wheeler Winston. "Tomorrowland TV: The Space Opera and Early Science Fiction Television". collected in Telotte, J.P. (ed.) (2008). The Essential Science Fiction Television Reader, pp. 96–110. University Press of Kentucky. ISBN 0-8131-2492-1, ISBN 978-0-8131-2492-6. Terrace, Vincent (2002). Crime Fighting Heroes of Television: Over 10,000 Facts from 151 Shows, 1949-2001. McFarland & Company. ISBN 0-7864-1395-6. Worsley, Jr., Wallace and Sue Dwiggens Worsley (1997). From Oz to E.T. : Wally Worsley's Half Century in Hollywood. Lanham, MD, Scarecrow. Wikimedia Commons has media related to Flash Gordon (1954 TV series).